Well, it’s been a long season, and it all comes to a close tomorrow (at least for Auburn, and maybe a few coaches and administrators). Over the past three months, we’ve taken a look back at the greatest games against each week’s opponents. Some weeks the choices have been clear, and some weeks there have been many games that could have been chosen. Obviously, the Iron Bowl has produced a plethora of great games, some of the greatest in college football history. Although you could consider games Auburn lost as being “great games,” that’s not what we do here. In order for a game to make this list, Auburn must have won. Any victory over the University of Alabama at Tuscaloosa is a great game, but this week (as we’ve done the previous three weeks) we’ll take a look back at the great wins that carried the most significance in the face of the strongest opposition. Sure, games such as the 1957 40-0 shutout victory to clinch a national title were huge, but unranked UAT and the lopsided margin were reasons enough to leave it off the list. While Saturday’s result may not be what we are hoping for, this week’s list should at least take you back to some happier times. Looking to clinch their first berth in the SEC Championship Game, the No. 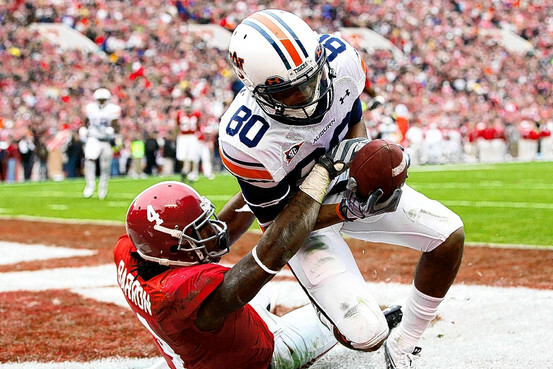 13-ranked Auburn Tigers entered the game as the heavy favorite over unranked Alabama. But the Tide came ready to play and jumped on the Tigers, even holding a 17-6 lead entering the fourth quarter. Auburn quarterback Dameyune Craig led the Tigers on two scoring drives in the final quarter, one a touchdown and the other a Jaret Holmes field goal, but the Tigers still trailed 17-15 with less than one minute remaining due to a failed two-point conversion. However, with the ball and a shot to run out the clock, the Tide elected to throw a screen pass rather than run the ball and the decision proved to be costly. As UAT quarterback Freddie Kitchens completed a pass to running back Ed Scissum, Martavious Houston put a helmet right on the ball, jarring it loose and Quinton Reese recovered the ball for the Tigers. With 15 seconds remaining, Holmes nailed the 39-yard field goal to send the Tigers to the SEC title game. In what was probably the most epic atmosphere in Jordan-Hare Stadium history, the Tigers hosted the Tide in Auburn for the first time in series history. Although the Tide led 10-7 at the half, the Tigers dominated the second half to down the No. 2-ranked Tide. The Tide pulled out all the stops in the game, faking a field goal and going for it multiple times on fourth down, but the Tigers and the Tiger faithful proved to be too much. The Auburn defense held the Tide to just 87 yards on the ground, while Tiger tailback Stacy Danley racked up 130 yards on 28 carries. With the victory, the Tigers secured their third consecutive SEC title. Carrying a nine-game win streak in the series, the Tide came into Legion Field confident of increasing the streak to 10 and sending head coach Paul Bryant out on top. A freshman from McCalla named Vincent Edward Jackson had other ideas. Leading 22-15 with just minutes remaining, the Tide looked poised to take another victory in the series, but the Tigers had possession. The Tigers running game drove Auburn deep into Bama territory before the Tide defense held strong near the goal line. Facing a fourth-and-goal, the Tigers went to Jackson, and Jackson went up and over the Tide defense, giving us the famed “Bo Over the Top.” Just two months later, Bryant died and the series has never been the same. Since the famed play, the Tigers lead the series 17-13. While the old-timers may argue this is the greatest game, it lacked one component: national title implications for the Tigers. The 14-point favorite Tide, who was also ranked No. 2 in the nation, dominated the game early, leading 16-0 with just 10 minutes remaining. But the Auburn special teams took over from there. The Tigers posted their first score of the game on a field goal with nine minutes remaining before Bill Newton and David Langner went to work. On the ensuing possession, the Tigers’ defense stood tall and forced the Tide to punt. The punt was blocked by Newton and Langner returned it 25 yards for the score. On the Tide’s next possession, the Tigers once again stopped UAT and forced the punt. Once again, Newton blocked the punt and Langner returned it for the score. With one last hope of winning the game, the Tide drive down the field, but the drive was stalled when Langner picked off a pass to secure one of the greatest comebacks in college football history. Despite entering the game 11-0 and No. 2 in the nation, Auburn visited the defending champion Crimson Tide as the underdogs. With a national title opportunity in sight, it was the Tide, not the Tigers, who looked like the national title team early in the game. In the first quarter, it was all Tide. Alabama opened with a 9-yard touchdown run by Mark Ingram before adding two more touchdowns on a 68-yard pass from Greg McElroy to Julio Jones and a 12-yard pass from McElroy to Darius Hanks. In the second quarter, the Tide was on the cusp of putting the game out of reach before Antoine Carter ran down Ingram following a 60-yard screen pass and punched the ball loose. The ball miraculously hugged the sideline and squirted into the end zone before it was recovered by Auburn’s Demond Washington. The Tigers failed to produce on the ensuing drive, and Alabama added three points on a Jeremy Shelley field goal after Tide running back Trent Richardson dropped a wide-open screen pass on the goal line. Down 24-0, the Tigers refused to be shut out and quarterback Cam Newton connected with Emory Blake on the following drive from 36 yards out to close the gap to 24-7. The Tigers didn’t manage much the rest of the half except for a crucial play by Lombardi Award winner Nick Fairley when he knocked the ball loose from McElroy and recovered the fumble. The second half, however, was all Tigers. On the second play from scrimmage, Newton hooked up with Terrell Zachery from 70 yards out to cut the lead to 24-14. After holding the Tide, Newton got back into the end zone on a 1-yard dive to pull the game to 24-21. Shelly added his second field goal of the game on a 32-yard kick, but it would be the last time the Tide would light up the scoreboard. With just less than 12 minutes remaining in the game, Newton sidestepped a Bama lineman and connected with Philip Lutzenkirchen from 7 yards out to give Auburn its first lead of the night, 28-27. It would be all the Tigers needed. Tiger defensive back T’Sharvan Bell sacked McElroy late in the game, sending the Tide quarterback to the sideline with a concussion and thus ending all hope of a Tide comeback. The Tigers went on to trounce South Carolina in the SEC Championship Game before completing the dream in Glendale, Ariz., by downing Oregon on a last-second Wes Byrum field goal to capture the BCS National Championship. In what was simply known as the “Sack Brodie Sack” game, the No. 11 Tigers sacked Alabama quarterback Brodie Croyle a record 11 times en route to the dominating victory over the No. 8 Tide. With running backs Carnell “Cadillac” Williams and Ronnie Brown out due to injuries, the Tigers turned to little man Tre Smith, who churched out 126 yards on 25 carries. Auburn quarterback Jason Campbell connected with tight end Robert Johnson twice for touchdowns to secure the victory over the No. 9-ranked and double-digit favorite Crimson Tide. The victory was the first of six in a row. In one of my favorite victories as a child, the Tigers “Reversed the Tide” when Lawyer Tillman’s failed timeout call proved to be crucial as Tillman took the reverse handoff from Tim Jesse and scampered 15 yards for the comeback victory over Alabama with less than 30 seconds remaining. In a low-scoring matchup between the No. 9-ranked Tigers and the No. 6-ranked Tide, the Tigers denied the Tide a chance at a national title game with the victory in Birmingham’s Legion Field. In an unusual February game, the Tigers took the first ever matchup in the series to begin what is nationally known as the greatest rivalry in all sports. I wonder what the dividing age line for people’s No. 1 game between ’72, ’89 and ’10. I would think Scoop would fall in the age group to put 1989 higher, but he must be younger than I thought. Is he not in his 40’s? proud to say I was at 4 of the top 5 games (didn’t try to get to the 28-27 National championship play-in game, although I DID watch it last night – and 82 also) Was also at all the Honorable mentions but ‘1893 and ”63…. An honorable mention has to go to 1983, because that game really solidified the “change in the relationship between the two schools” (as Keith Jackson kept stating during the broadcast) that was started with Bo over the top.